80 Acres in Elmwood, WI with EVERYTHING! 4 Bedrooms – 2.75 Baths – 2 Car Heated Garage – 2,944 Finished Sq. Ft.
A charming country retreat that ticks all the boxes. 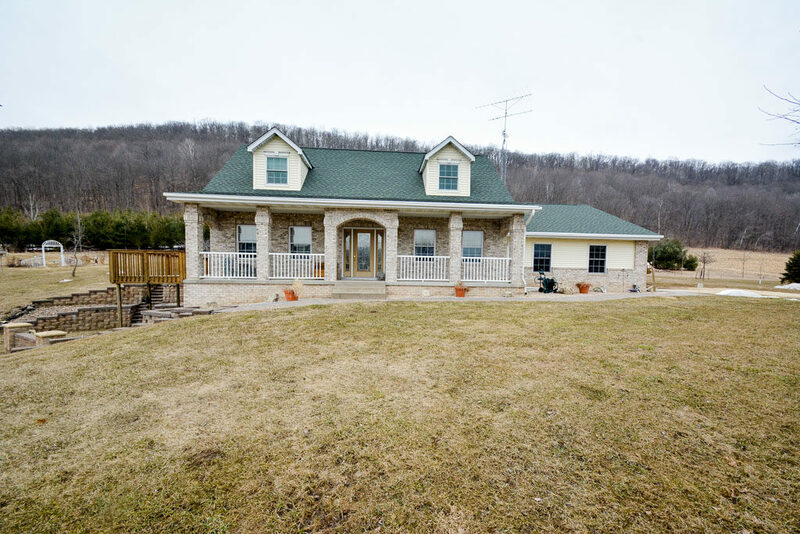 A gorgeous home, plenty of land for recreation and farming, and functional out buildings ideal for hobbies, business, or livestock. Breathe deeply, take in the glorious hills and valleys of this beautiful landscape. The custom-built cape cod style home offers country charm and efficient layout for easy family living and entertaining, while also offering the rural lifestyle you crave. With a heated work shop and a separate barn, the property is ready for your workshop and storage needs, while the land offers income potential and fun. 80-acres multi-use acres. Your land includes 30 acres of tillable land that is currently leased to a local farmer (who will continue to lease the land if you want) 45 acres are heavily wooded river valley hillside. Trails carved through the woods are ideal for ATVs. Hiking, or snowmobiles. Easy care landscaping around the house means you can spend more time enjoying your property. Outdoor spaces include a deck off the main floor dining room, and a paver patio off the walk out lower level. The land is dividable. Charming country estate. As you drive up to the house, you will get the sense that this place simply feels like home. The front porch, with brick façade and white railings, beckons you for a summer evening’s relaxation. Dormer windows offer charming curb appeal, while maintenance free vinyl siding and a new roof in 2013 mean you can spend more time enjoying your property. With wooded hills as a backdrop, you know this is the place for your dream of a country life. Ideal features for casual living. You want all the outdoor space and outbuildings, but a functional home is critical. A large kitchen is open to the dining room and living room, offering the open concept that is ideal for entertaining and everyday living. You’ll love having a main floor master with a full bath and laundry nearby. Upstairs, two very spacious bedrooms with dormer windows share a bath. The finished lower level has a family room with a dramatic gas fireplace, full kitchen, bedroom and .75 bath. Access your paver patio through sliding doors. The lower level could be used as an apartment. Business or hobby space. Two out buildings provide space for your hobbies, business, or storage. The shop building is 40 ft. x 64 ft., half of which is heated and insulated and offers electric and water. The other half is a large storage room with concrete floor and tall garage door for larger equipment or trucks. The roof extends 12 feet to the side to offer covered outdoor storage for trailers, boats, hay, etc. The barn is 30 ft. x 40 ft. has electricity, garage door, and windows. It would be ideal for livestock or equipment storage. Extras! The home has forced air heat with supplemental heat offered by the wood burner outside behind the home. The windmill is functional and powers a well dedicated for agricultural use. Both out buildings have electrical service. One is heated and insulated. The attached 2-car garage is also insulated and heated. Income potential. 30 acres of tillable land are currently leased to a local farmer. The out buildings are ideal for your home-based business or livestock, and the land is dividable, offering you numerous opportunities to benefit from the property. The maple trees are suitable for syrup. Great Location! Located east of Elmwood, WI on State Road 72. About 20 minutes from Menomonie, WI and 40 minutes to River Falls, WI. Elmwood Schools. Contact John and Becky Durham for more information. "We have the BEST realtors who listened to what we needed and made it happen. We can’t thank you enough for all your help with this process. From sticking with us as we transitioned to going 100 mph when... continued"